Manufactured by the Aircraft Appliance Corporation. 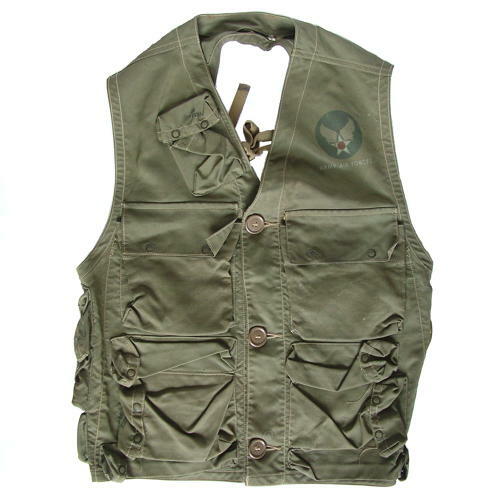 Commonly known as the C-1 survival vest. The material is in generally in good condition and complete with all pockets, pistol holster and straps. There is a smallish hole at the back of the neck and general wear and soiling. All the pockets are labelled to indicate location of the numerous and varied survival aids. Very good/clear colour AAF winged star printed to left breast. AAF labelled and with inspection stamps. Empty. Stock code S21035.